I am biased, it’s true. This book was destined to have a good review on two counts. Firstly I adore the author, Will Torrent; and chocolate comes a close second to Will. Will Torrent has worked with the best – with such culinary worthies as Brian Turner CBE and Gary Rhodes. He is also a consultant for Waitrose and is already known for his cakes and desserts. Chocolate at Home follows his Patisserie at Home and is bound to be equally popular. I have always found chocolate a temperamental substance to handle. I have had more bowls of grainy and unappetising melted-yet-solid chocolate than I can wave a Mars Bar at. And while we are on the subject of traditional confections I stand up and confess that I also love those cheap but comforting shop-bought favourites from time to time. But the recipes here provide treats that are decadent, high-end, and addictive, and more than a cut above anything from the corner shop. My first choice of recipe might be something of a surprise. It’s a rice pudding with white chocolate. Yes, I know. You are shouting that white chocolate isn’t even real chocolate. Let us consider its characteristics: it melts; it has a delightful mouth-feel; it’s sweet, perhaps too sweet for a purist; it’s delicious. That ticks enough pertinent boxes to be included in this book. White Chocolate, Coconut Rice Pudding with Caramelized Mango is memorable and rather smart. Mangoes and coconuts are common, Kaffir lime leaves are available at Asian stores and pudding rice is something you would likely not have eaten since school days. This is about as far from that rice pud as one would want to get. It’s rich and exotic and would make a striking end to any Asian meal or even to a regular Sunday lunch. For those who want a hit of the dark stuff then Salted Caramel Honeycomb & Chocolate Profiteroles will give you just enough to have you begging for more. The profiteroles are made with the regular choux pastry which is easier than you might think to make. The filling is for which to die, containing both honeycomb and canned caramel. The chocolate element is provided by the sauce which is glossy and sophisticated. The teasing is over. Here is a recipe for Salted Brown Sugar Caramel Truffles that will satisfy even the most dedicated chocoholic. This has a standard truffle method of melting chocolate with hot cream but that muscovado does add an adult flavour. In fact the only difficult parts of this recipe are two of the later steps: ‘Chill the truffles in the fridge for about 30 minutes to set firm’, and ‘transfer the coated truffles to the lined baking sheet to set firm before serving’. The chances of a full complement of truffles reaching the presentation plate are slim. 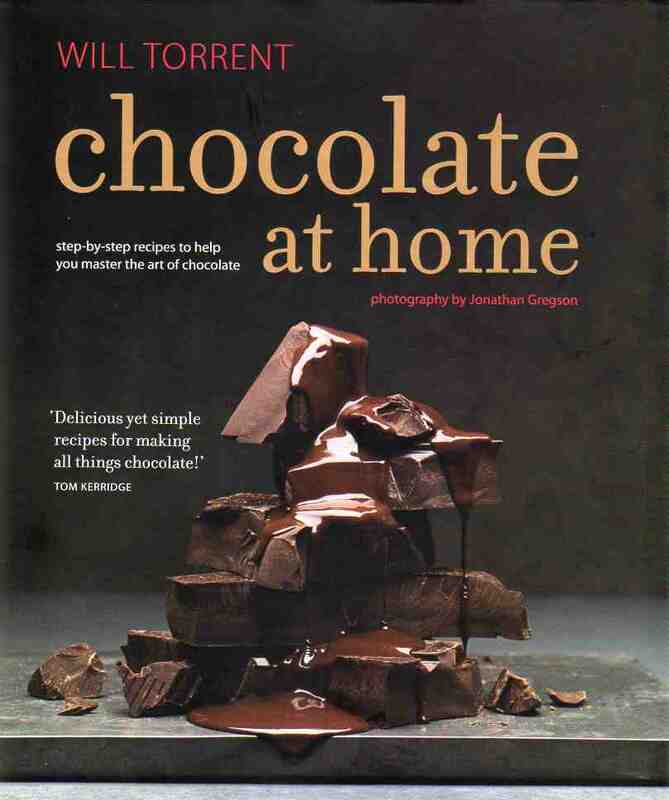 Chocolate at Home offers a raft of tempting and accessible recipes from a great talent. Will is a master of all things sweet. This would be a great Christmas gift for any chocolate-lover but also an any-time gift for the keen home cook who wants to add to his/her gastronomic battery. I will be hanging on to my copy and using the recipes to produce nibbles for the holidays.